Dual core processors are the standard in today's computers. 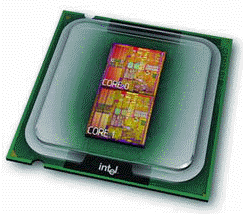 The dual core architecture helps manufacturers to extend the performance curve. Faster is better. Being able to do more is also better. Well, let's take a look at the details of it. As software developers are coming out with more advanced applications, tasks that computers can perform these days are getting more and more complicated. While you had to go for a coffee brake when burning a CD on Windows 3.11, you can burn a DVD, listen to online radio, and play graphics-intensive games at the same time today. Multitasking is as natural today as breathing, but it also requires more power and speed than ever before. For processor manufacturers dual core means a less expensive route to producing a new product that continues the performance curve. Getting existing processors to work faster is getting too expensive and more complicated, so manufacturers having the option of just bundling two cores into one processor see it as an easy way to keep going. After all, what sounds better: "two 2.0 GHz cores" or "dual core processor described as a 3.4 GHz comparable"? Selling a dual core processor computer sounds good to the average computer user. Dual core is something new, dual core sounds good, and dual core is easily comprehensible. Two is always better than one, right? Dual core - a way to go faster? The dual core game can be seen as a new twist to the gigahertz performance race. Increasing the clock speed of a processor was the traditional approach in making processors faster since a faster CPU can do one task quickly and then quickly switch and work on the next. Both AMD and INTEL scaled up the clock speeds of their processors in a very short amount of time. However, due to size, complexity, and heat issues, it has become increasingly difficult to make CPUs go faster. There is a limit to how small crystals, transistors, pathways you can make, and it seems that the ability of the nano industry to make things faster by making components smaller is getting to a pause. The clock speed curve is flattening. Another solution had to be found in order to continue to improve performance. If processor manufacturers cannot make processors faster (while also economically feasible) with the currently available technologies, the next step is to add more processors into the system. One way is to just add more CPUs into the system. However, this is quite expensive for the average Joe, so computer engineers came up with another approach: take two processors and combine them together, so they still have some benefits of the two but also economies arising from sharing some related components. They came with the idea of two CPUs but only one socket on the motherboard, called a dual core processor. Dual core keeps the price of the system reasonable while improving the performance. In other words, another route to continue the performance curve is to develop dual core and multi-core processors, that is two or more CPUs put together on one chip. Where a dual-core processor becomes handy? A dual core processor benefits anyone who multitasks. Multitasking in a single-core processor computer works in a way that the processor keeps quickly switching between your applications. In a dual core processor system, there is the second processor core to share the load either in balanced form or by itself. While one processor is employed by burning a DVD, the other processor is available to process your email. The critical feature here is that multiple tasks are executed simultaneously. Do I need a dual core processor computer? It depends on what you do with your computer. If you just send emails and write letters, then probably not. If you do video editing, burn DVDs, play games, and do a lot of switching between applications, then the answer is yes. Regardless of what you do, the computer industry follows the masses. Or, do they lead the masses? Some times, it is hard to say whether the manufacturers listen to what buyers want and create products for them, or the other way around - whether the manufacturers create a product and then make everyone buy it. Laptop displays is a great example. All laptops today come by default with wide displays. If you want a display with the standard 4:3 ratio, you are out of luck, nobody makes them anymore. The reason is the cost and mass production. Does everyone not like 4:3 displays, or did the manufacturers force everyone to switch to wide by not making anything else available? The same can be seen with processors. Dual core and multi core is likely to become the standard. How can I tell if my computer has a dual core processor? You can tell by going to the Task Manager. Task Manager shows how many cores your computer has. Unfortunately, Task Manager does not distinguish between cores and processors. Task Manager does not tell you whether the computer shown in the picture above is a single-processor with four cores (quad core processor) or a server with four single core processors. But it at least tells you that you have more than one of something. Is there a problem with dual core and multi-core processors? Yes, nothing comes for free. The main problem with winding up clock speeds is heat. Nowadays processors are pushed to extreme speeds. Just compare - processors run in today's computers at some 2-3 GHz. Electric current in your house runs at 50 Hz (or 60 Hz in Europe). You can imagine the processor speed as RPM in your car. Your car engine and processors too can operate at only so much RPM before they seize. Heat is the enemy of any processor and high clock speeds mean high heat and that means errors and shorter lifetime. That heat comes from power. It takes a lot of power to run a processor at 2 or 3 GHz. Most laptops that you can buy today come with Li-Ion batteries. Remember your old laptop that you bought 10 years ago. It came with Ni-Mh batteries. Today's laptop with high clock speed processors would not run very long with your old batteries. A high-clock-speed processor needs a lot of electricity to power all the speed and is therefore prone to electrical noise which causes interference. 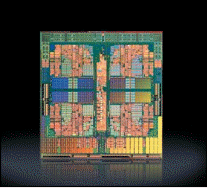 The pathways on a processor are microscopically close together. The more power that runs through these pathways due to the requirement of higher clock speeds means that there will be a small amount of electrical radiation from one pathway to the next. If the radiation is large enough, it causes data errors. Are two cores (a dual core processor) better than one core? Before instructions get into the processor, they are loaded into so called pipeline. Data flows into a processor via a pipeline and is processed sequentially one after another. Data that is used continually is stored in the processor's cache. A processor is able to determine which data to store in cache and which it may need later. The processor cache is running at the same clock speed as the processor itself. If your processor runs at 2.4 GHz then the data between the processor and its cache can be exchanged at the same speed. If a processor needs to reach outside of the cache, then it does so through the bus to the system RAM. Both the bus and RAM run at far slower speeds than the processor; therefore, if the processor has to reach out through the bus to the main system memory RAM, then it must slow down to that bus speed. It is probably starting to be obvious that having two cores that access the same processor cache can get the job done more quickly (especially if the processor is designed as Symmetric Multiprocessing (SMP)). What is the difference between a dual core processor system and a system with two single core processors? A dual core processor is somewhere between a single-core processor system and a dual-processor system. A dual core processor has two processor cores that share the surrounding hardware, such as the memory controller and bus. In this case we are talking about one processor with double guts. A dual processor system has completely separate hardware and shares nothing with the other processor. In this case we are talking about two processors with each having its own guts. As it may seem, a dual core processor is not twice as fast as a single core processor. A dual core processor is also not going to be as fast as a dual processor system. It will be somewhere in between. You might like to read about grid computing, blade servers, Windows Server 2008, and 64 bit architecture.